Last week I came across a familiar name in the obituary pages of the paper, Loulou de la Falaise. It’s not the sort of name that you could forget easily. It was quite a brief entry. It mentioned that in the 1960s she was a wild child and fashion editor for Harper’s Bazaar and that she then became a model in New York where she got to know all the famous photographers and artists of that time. By the early 1970s she had become friends with Yves St Laurent, and had become his muse, although apparently that’s not a title that she liked. She helped him with his designs and also designed jewellery for him. She stayed with him for 30 years and after he died she continued designing jewellery. Apparently, she also liked gardening. I first came across her name earlier this year at the International Festival of Gardens at the Château de Chaumont in the Loire Valley. 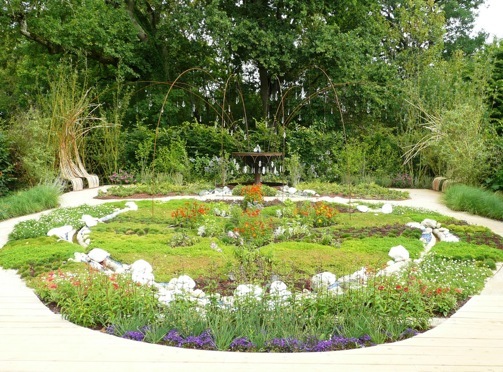 She was one of five personalities invited to create either a garden or an artwork for the festival. While I can’t remember the names of the others, she has such an interesting story, and with a name like that, I couldn’t forget her. 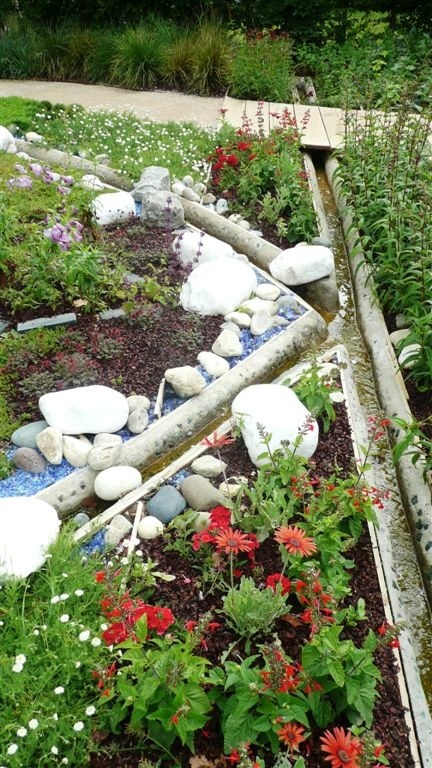 In the festival guidebook, the garden she created is described as being ‘a jewel, a necklace and brooch garden, playing with the plants in the same way she knows how to play with coral, pearls and amethysts’. The garden has lots of splashes of colour, perhaps representing the jewels in her designs, and the circular elements of the design evoke the necklace. I just love the fountain which looks fantastic with, or without, water. On either side of the fountain there are cleverly designed willow seats. 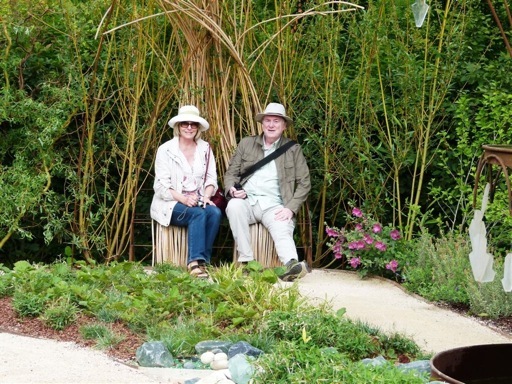 One of the nice features of the festival is that you can wander through the display gardens and even sit on the furniture, which gives a real sense of what the designer was trying to achieve.